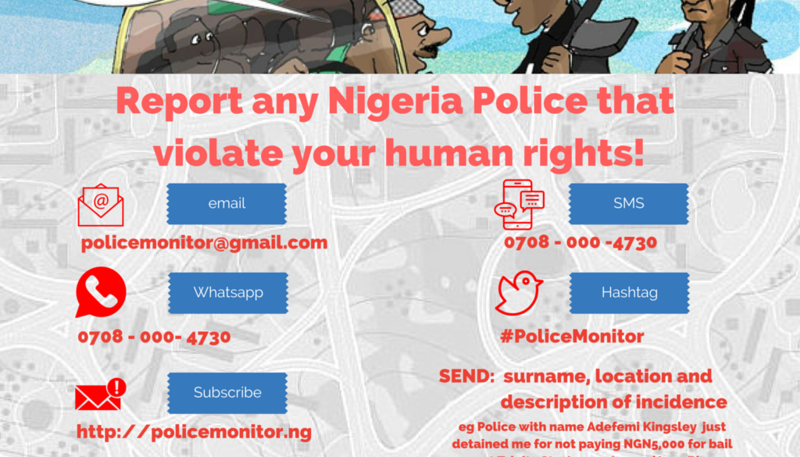 Connected Development [CODE], a non government organization whose mission is to empower marginalized communities in partnership with Network on Police Reform in Nigeria (NOPRIN), a coalition of 49 Civil Society Organizations [CSOs] working on police reforms in Nigeria, on June 30, 2016 has lunched a real-time situation awareness platform at http://policemonitor.ng to document the human rights abuse by police on citizens and vice versa. The Nigeria Police, as a pillar of democracy, has over the years, infringed on the human rights of Nigerians, with unlawful detention escalating everyday, and the rate of extortion of citizens becoming alarming, while all of this happens without documentation. “This is an open platform that will document several human rights abuse of the Nigeria Police on Nigerian citizen, it will be used in engaging the Nigeria Police and the judiciary to foster social justice for the citizens” said Oludotun Babayemi, the co -founder of Connected Development [CODE] during the unveiling of the platform. The citizen driven platform will complement the Nigeria Police complaint response unit (CRU), which between January and March, was reported to have received and processed 1,054 complaints from across the 36 states and FCT, while 20 officers have been sanctioned. “We are not even sure that the CRU will survive in this new dispensation. It is hoped this new citizen – driven platform will compliment it and remain the real citizens’ platform to report and monitor police abuses in Nigeria and to fight to ensure justice for victims and accountability by perpetrators” affirmed Okechukwu Nwagunwa, the National Coordinator of NOPRIN during the training for CSOs and the Media in Lagos,where the platform was launched. CODE is a Nigerian Non Governmental Organization, founded in 2012 to empower marginalized community by creating innovative ways of establishing feedback loops between citizens and state agents. Network on Police Reform in Nigeria (NOPRIN Foundation) is a network of 49 civil society organisations spread across Nigeria, and committed to promoting police accountability and respect for human rights. It was established in 2000 to provide opportunity for civil society input to police reform, and the enhancement of safety, security and justice. NOPRIN carries out its mandates through monitoring, research, investigations, documentation and advocacy.